Welcome to the Sarah's Ducklings website. Sarah was diagnosed with Type 1 diabetes in 2010 at the age of 4. Shortly after, we formed our Sarah's Ducklings walk team. 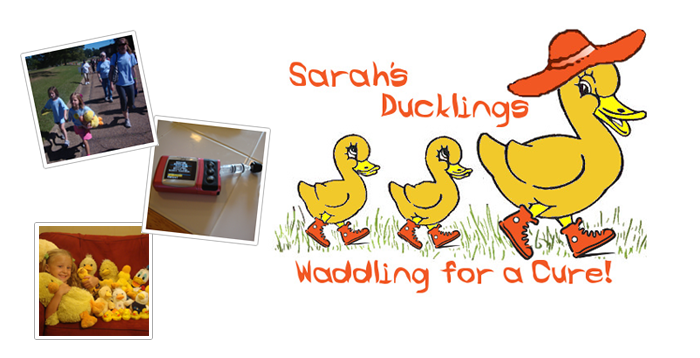 The goal of Sarah's Ducklings is to increase education and awareness of Type 1 Diabetes and to participate in, and fundraise for, two local diabetes walks - Mississippi's Walk for Diabetes benefiting the Diabetes Foundation of Mississippi (DFM) and the JDRF One Walk benefiting the Juvenile Diabetes Research Foundation. What is Type 1 Diabetes? Unless you have a close friend or relative with Type 1 Diabetes, you can probably throw most of what you know out the window. Type 1 Diabetes is an autoimmune disease meaning your immune system goes into overdrive and kills the insulin-producing cells in your pancreas. We do not know exactly what causes Type 1 - some prevelant theory is that the body over reacts to a common illness - but we do know that it is NOT caused by weight or sedentary lifestyle. Sarah was weighed only 32 lbs when she was diagnosed at age 4 and was/is a very active child. Mangement of of Type 1 Diabetes includes frequent finger sticks to test blood glucose level and multiple daily insulin injections, either via a shot or an insulin pump. There is currently no cure and Sarah will never outgrow it.